The Reconstruction Finance Corporation was a federal lending agency created by the U.S. government under President Herbert Hoover to rescue banks on the brink of failure and restore Americans' faith in the financial system while minimizing the crises of the Great Depression in the early 1930s. The Reconstruction Finance Corporation eventually grew in scope to finance agricultural, commercial and industrial endeavors through billions of dollars in loans until it was disbanded in 1957. It played a significant role in funding New Deal programs under President Franklin Delano Roosevelt to help the United States recover from its worst financial crisis. The Reconstruction Finance Corporation was created by Congress on Jan. 22, 1932, amid the Great Depression to provide emergency capital to financial institutions. The support provided to those banks has been likened to the bailouts provided in modern times. The Reconstruction Finance Corporation helped minimize bank failures and improve monetary conditions prior to the banking crisis of 1933 by financing agriculture, commerce and industry. Under President Franklin Delano Roosevelt's New Deal, the Reconstruction Finance Corporation became the largest investor in the economy, representing a relocation of American's economic power from Wall Street to Washington, D.C., according to historians. 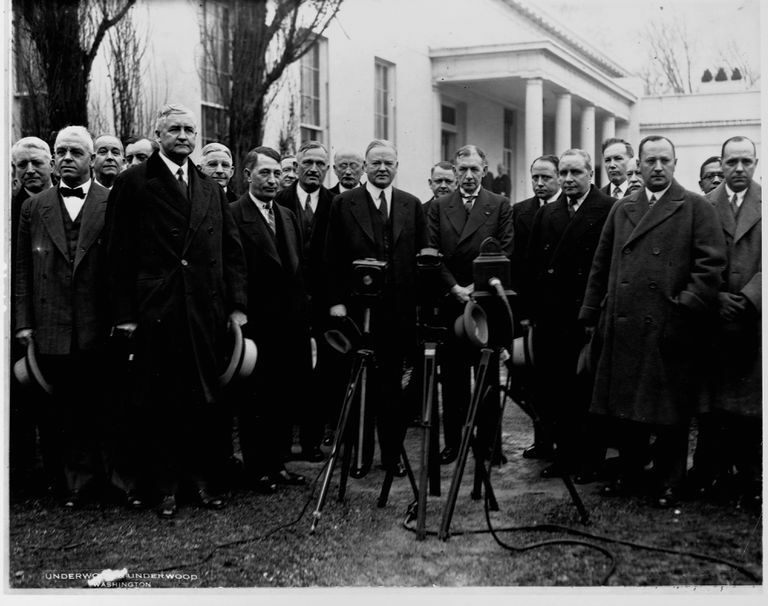 Signed into law by Hoover on Jan. 22, 1932, the Reconstruction Finance Act created the federal lending agency with $500 million in capital from the U.S. Treasury "to provide emergency financing facilities for financial institutions, to aid in financing agriculture, commerce, and industry." "It brings into being a powerful organization with adequate resources, able to strengthen weaknesses that may develop in our credit, banking, and railway structure, in order to permit business and industry to carry on normal activities free from the fear of unexpected shocks and retarding influences. Its purpose is to stop deflation in agriculture and industry and thus to increase employment by the restoration of men to their normal jobs. … It should give opportunity to mobilize the gigantic strength of our country for recovery." The agency was modeled after the War Finance Corporation, the federal government's effort to "centralize, coordinate, and fund the procurement and supply operations that accompanied formal U.S. entry into World War I in April 1917," according to Federal Reserve Bank of Cleveland research officer Walker F. Todd. The Reconstruction Finance Corporation distributed nearly $2 billion a year in loans in its first three years of existence, though the money was not enough to lift the country out of its economic woes. The money did, however, provide liquidity to the financial system and prevent many banks from failing by allowing Americans to remove their savings. The Reconstruction Finance Corporation endured criticism for bailing out some banks and railroads and not others—particularly larger institutions instead of smaller, community-based ones. For example, the Reconstruction Finance Corporation was hit for lending $65 million in the early years to Bank of America and $264 million to railroads controlled by some of the wealthiest families and corporations in the nation. The original plan for the agency was to help rescue small banks in rural parts of the United States that typically did not have access to Federal Reserve loans. The agency was also subject to scrutiny because of its secretive nature, at least at first, and because it was seen as corrupt under Chairman Jesse Jones, a Houston businessman, in the final stages of its existence. It was revealed, for example, that the Reconstruction Finance Corporation had loaned $90 million to a Chicago bank whose chairman had served as president of the agency. Eventually the agency was forced to disclose the name of all of its borrowers under the Emergency Relief and Construction Act. The agency revealed that many of the borrowers were, in fact, large banks not intended to benefit from the corporation. The agency stopped lending money in 1953 and ceased operations in 1957. The creation of the Reconstruction Finance Corporation is credited with saving many banks and it also provided an alternative to the controversial plan of making the Federal Reserve the so-called lender of last resort to failing financial institutions during this crisis. (A lender of last resort is a term used to describe the central bank of a nation that works to rescue troubled institutions. The Federal Reserve acts in that capacity in the United States.) Critics of the Federal Reserve plan worried it would lead to inflation and even deepen the nation's depression. The agency also served to "strengthen the capital structure of the banking system" and eventually morphed into a "convenient agency through which to extend government credit to many additional groups which the Roosevelt administration sought to aid," wrote B.W. Patch in the 1935 CQ Press publication The R.F.C. under Hoover and Roosevelt. As supporters of the Reconstruction Finance Corporation noted at the time of its creation, the agency's mission was not merely saving the banks but to provide relief to millions of Americans who had deposited their money in them. Allowing the banks to fail, in other words, would have led to hardship beyond which the Depression had already inflicted. “Records of the Reconstruction Finance Corporation.” National Archives and Records Administration, National Archives and Records Administration, www.archives.gov/research/guide-fed-records/groups/234.html#234.1. Patch, B.W. “The R.F.C. Under Hoover and Roosevelt.” CQ Researcher by CQ Press, Congressional Quarterly Press, 17 July 1935, library.cqpress.com/cqresearcher/document.php?id=cqresrre1935071700. "Saving Capitalism: The Reconstruction Finance Corporation and the New Deal, 1933-1940." Olson, James Stuart, Princeton University Press, Mar 14, 2017.